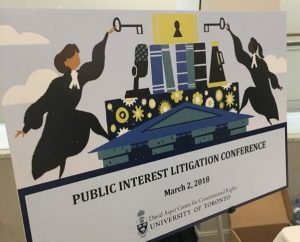 The Asper Centre’s Public Interest Litigation Conference offered numerous panels on topics ranging from specific case examples to broader litigation strategies for parties and interveners including non-litigation forms of advocacy and funding for the cause. One discrete panel focused on the broad topic of how public interest litigation intersects with private rights. As one might expect, the topics covered were varied. In the realm of gene patents, Professor Richard Gold and Rachel Meland spoke of private rights interfering with the public interest in vital healthcare services. In contrast, Howard Anglin spoke on the R v Comeau case and how old prohibition era laws enacted in the public interest interfere with citizens’ ability to freely trade alcohol between the provinces, contrary to s. 121 of the Constitution Act, 1867. On a procedural level, Christine Laing discussed how security for costs negatively impacts public interest litigation. Finally, Eleanor Vaughan discussed how solicitor-client privilege bars access to some information in public interest litigation. Professor Richard Gold and Rachel Meland presented on the consequences of corporations acquiring gene patents. Once a property right is granted, the right holding corporation becomes exclusively able to conduct tests on this particular part of person’s genome. This significantly hinders efficient diagnostic testing, requiring DNA samples be sent to many different labs rather than having a centralized parallel analysis conducted. In 2016, Professor Gold worked with the Children’s Hospital of Eastern Ontario in an action brought against Transgenomic, Inc. over the right to test for Long QT syndrome for patients in Canada. Transgenomic owns the patent for this gene. The matter was resolved in a settlement, in which Transgenomic granted licences to non-profit organizations to use the genes for non-profit diagnostic testing. Christine Laing presented on the challenges posed by ordering that the claimant provide security for legal costs in public interest litigation, primarily granted for the benefit of the responding private litigant. The financial liability that this imposes on the public interest organization or litigant is often deterring or entirely prohibitive. Currently there is no particular test for when the Ontario Court of Appeal (ONCA) assesses the justness of security for costs. It is discretionary. However, she argues that it seems to consider whether the claim could be considered vexatious. A recent case that exemplifies this reasoning is Yaiguaje v Chevron, in which the ONCA overturned the decision of the Court of Appeal motions judge that required the plaintiffs to post $942,951.00 as security for costs. Howard Anglin discussed the R v Comeau case, in which he represented the defendant, who was charged with illegally taking alcohol from Quebec to New Brunswick. The defendant’s position is that the charges are contrary to s. 121 of the Constitution Act, 1867, which states “All Articles of the Growth, Produce, or Manufacture of any one of the Provinces shall, from and after the Union, be admitted free into each of the other Provinces.” The case has significant implications for the alcohol industry in Canada in particular, but in preserving a shared Canadian marketplace generally. Finally, Eleanor Vaughan presented on legal privilege. Solicitor-client privilege was recognized as a principle of fundamental justice in the 2008 Canada (Privacy Commissioner) v Blood Tribe Department of Health case. The importance and protected status of solicitor-client privilege was upheld in Alberta (Information and Privacy Commissioner) v University of Calgary. This crucial component of our justice system is also capable of impairing public interest endeavours when it bars access to information that may be material to a case. The intersection of public interest and private rights is a balancing process. In the context of genetic research, full patent rights pale in importance compared to life saving medical testing; but on the other hand, solicitor-client privilege is too important a right to be curtailed in pursuit of the public interest. On a case by case basis, the court will need to evaluate the relative merits of each implicated interest as private rights and public interest conflict in the future. Ryan Howes is a JD Candidate at the University of Toronto Faculty of Law and was the Asper Centre work-study student in 2017/18.